The plethora of portable devices we now rely upon means that extra care needs to be taken when travelling around with them. But a lost or stolen device can be viewed as a mere inconvenience when set against the value of the data which may be stored on it. Organisations need to ensure that its employees take the right precautions to keep sensitive corporate information safe. This is not always a straightforward task as this information no longer resides in the office but can be spread across the globe on the devices of its mobile workforce. One major security breach could cause serious damage to the reputation an organisation has worked hard to build. In 2007 the UK’s largest building society, Nationwide, was hit with a fine of almost £1 million after one of its employees had their laptop stolen from home. The laptop contained confidential customer information and the society was found, by the then Financial Services Authority, to have inadequate procedures and controls in place . Of course, any organisation worth its salt will have sophisticated encryption software in place but there are a number of precautions that can be taken to ensure that the inconvenience (and embarrassment!) of a lost devise does not arise. Invest in a laptop / iPad security case for protection against damage and theft. Safelincs’ range of cases and bags feature high quality security cables to attach the mobile device to a fixed object and prevent a laptop bag or security case from being snatched. These can be secured to almost any fixed item and are ideal for use in the boot of a car, hotel room or office. If you need to leave your laptop in a hotel room, put the “Do Not Disturb” sign on the door. Wherever possible, sensitive data should not be held on laptops. A drink with colleagues after work is a common way of unwinding. But keep an eye on your bag, especially if it’s got your laptop in it. Opportunist thieves are known to strike when people are relaxing and off guard. There have been incidences of people in cars being robbed while stopped, often at traffic lights. So make sure that anything valuable is not on show. If possible, ensure all doors and the boot are locked. 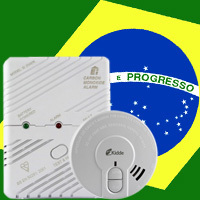 Presenters and reporters travelling to the World Cup in Brazil have been equipped with smoke alarms, heat alarms and carbon monoxide alarms by Safelincs. Any organisation that has employees travelling abroad has a duty of care to ensure that their health and safety is protected. The BBC has its people covering football matches in different parts of Brazil and they will be staying in various types of accommodation. Safelincs were able to provide the BBC with a comprehensive selection of products at competitive prices, all delivered in timescales that were second to none.